Every gun owner needs to invest in the best car gun safe to ensure their firearm remains securely locked when on the move and not in use to ensure your safety and that of those around you. 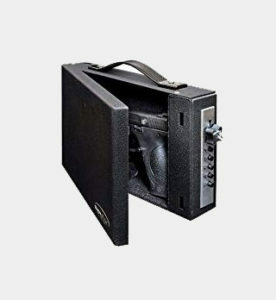 The market offers several gun safes for automobiles with the expectation of meeting the different needs, wants, and preferences of different individuals. 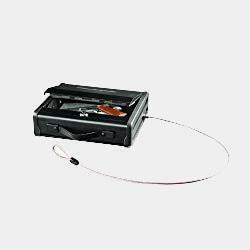 You will come across car gun safes offering different features as well as come in different sizes. Depending on the vehicle in question and other factors to put into consideration, you will be able to point out the best gun safe to meet your key objectives. There are a number of factors to put into consideration when looking to purchase the best car gun safe. 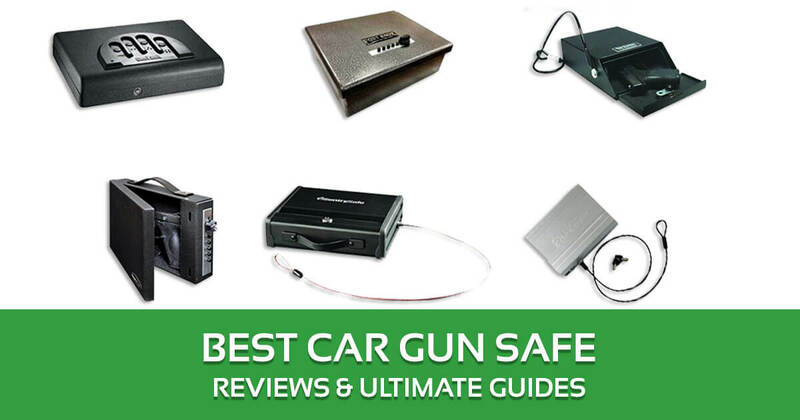 The following are important pointers to consider before settling for a gun safe for your car. Different people have different cars, and this translates to purchasing a car gun safe that will fit into your car. This factor also dictates the shape and size of the gun safe. Many safes are kept under the car seat and this must be put into consideration. The key consideration is buying a safe that your gun will fit. It is important to remember that many guns that will be stored in a car are normally small such as pistols and handguns. Even with this category shortlisted, they do offer different sizes. It is important that you are precise with this factor to ensure you buy one that will securely store your gun without forcing it closed. There are two major categories under this consideration: a manual or electronic/biometric safe. Both have their advantages and disadvantages and thus the quest to look into your needs. Manual locks require that you use a key to open it, and while this can be tricky, it is an advantage as it only allows the key holder to open it. 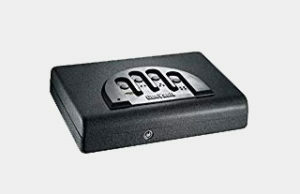 The electronic lock is fast and easy to open with the use of a combination code, and it opens. However, these require a power source to operate. The ability to bolt down your safe makes it difficult for a thug to run away with your gun safe. The safe remains in position as placed at all times. Other considerations other than the key factors above will include the brand of the safe, its weight, as well as the interior comfort and lining of the safe. These come together to provide the perfect fit. This is your ideal gun safe for automobiles whether it is a car, motorcycle, truck, or for use at home to help safely store your gun. It has 16-gauge powder coated steel making it durable and strong. To keep it locked, it comes with a key to help gain access. To keep it in place, it comes with a high strength security cable. However, do not expose this cable to prevent increasing the risk of theft as individuals can see where to cut it. You can opt to mount it vertically or horizontally. This comes in handy to help provide a perfect fit depending on the vehicle you own. It comes with mounting screws to ease the installation process. It ensures security because the thick cable cannot be easily cut even with a wire cutter. The tamper proof lock ensures that only the safe’s key can help gain access to its content. The construction is strong and sturdy with the ability to fit even in small cars. The gun will not move even when you are on the go thanks to the interior padding. This also your gun does no suffer from any damages or scratches thus upholding the performance of your gun. This car gun safe makes it possible for you to store a variety of guns ranging from 1911 framed semi-autos to revolvers. Depending on where you want to place it, it has the ability to mount it vertically or horizontally allowing for a great fit. It features a 14 gauge steel construction that makes it strong, reliable, and sturdy. To access it, it comes with a combination lock thus increasing the aspect of security, as you are the only one who has the codes with you. To further boost security, it has 5-button in-line lock, and the combination possibilities are more than 1000. With your combination in mind, it will take you just a few seconds to access your gun. Overall, this gun safe is reliable, provides a great fit for your gun, as well as boosts security. It offers fast access to your gun or other important documents in just a few seconds. It offers sufficient space for right about any full-sized pistol while leaving enough room to spare just in case you need to store other important small items. While security is upheld, it is a pity that you cannot use one button more than once when setting the combination lock. For example, you cannot use 1123. For individuals who are constantly on the move, this is one of the best car gun safes in the market for you. This is because it is versatile allowing you to not only store your gun but also other sensitive travel documents such as your passports, home keys, or even your mobile phone. In an effort to help secure it in place, it comes with a 3 ft. Multi-Strand braided steel cable that is strong and will not allow for easy cutting. It comes with a tubular key lock that makes it difficult to pick. A key opens the lock but the package offers two keys so you do not remain stranded in case one goes missing. The outer case is made from aluminum with 2mm thickness to prevent easy breakages whereas the drawer holding the contents is made from steel of 12mm thickness. This combination boosts security. It comes at an average weight of 2.8 pounds making it perfect for a handgun. 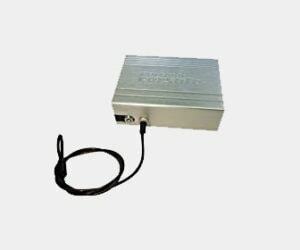 This is one of the heaviest car gun safes in the market with 10-gauge steel and a wrap-around lid, which makes it very strong and sturdy. Just to prove this, it exceeds the CA firearms safety device requirements, so you do not have to worry about forced entry into this car gun safe. In this, the only entry point is the door. Because of the weight, it features a gas strut that makes it easy for you to open the door. It has a mechanical push button lock and to open the door. You need to set your unique lock combination. You will need a 5-digit code and with more than 1081 user combinations, the chances of quick default access are at the minimal, as it will take a lot of time to try to key in every possible combination. The external dimensions of 4 ¼ inches high by 12 ½ inches wide by 10 3/8 inches are ideal to provide a great fit so it remains in position and remains discrete. 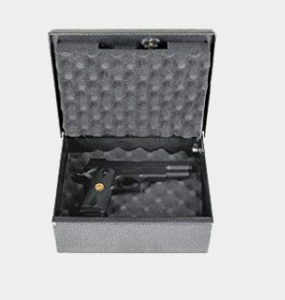 Individuals looking for a car gun safe that upholds security while at the same time ensuring that it is easy to access for authorized personnel will consider the SentrySafe PP1K Portable Pistol Safe. It features a backlit digital lock that makes it easy and fast to access as long as you have the access codes. In the event there is a malfunction with the lock system due to lack of power, you can access your content with the help of a master override key. To help secure your gun and other contents, the hinges remain hidden making it a little complicated to see. Thieves will, therefore, have a hard time accessing a breakage point. It comes with a gas strut compression that makes it easy for you to open the door after keying in the combination while at the same time keeping it on the low with quiet access. It does not come with any cables thus preventing the possibility of leaving a mess. This is considered as one of the best car gun safes in the market as it is strong and sturdy yet it remains light in weight. It comes with the 20gauge steel, so it remains durable. While the exterior is built to be strong, the interior comes with a foam lining that serves the purpose of ensuring that your gun and other items do not encounter scratches or are damaged easily. Its dimensions: make it ideal to store your gun and a few small items thus boosting versatility. It features Learn buttons that provide you with the ability to program your unique access codes with more than 12 million user codes to choose from. This also boosts security as it makes it almost impossible for intruders to make the right guess. In the event, there is a problem with the system, no need to worry. You can use the override keys to gain access to your content. It also protects your content from damage and scratches thanks to its interior foam lining. It may seem like a bit much but a hidden car gun safe can be your best option if you like to travel with your guns. There are several reasons why getting one is the best choice is you have when it comes to gun transport. An under seat gun safe ensures that no one but you knows the guns are there. They also secure your guns from the curious hands of children. When you hear about tragic accidents that involve children and guns, you can be sure that they were avoidable. It only needed a secure gun safe to keep the guns away from being taken by children. With travel, it is more likely for children to get their hands on your guns, especially if you just store them in the back of your car. Travel is the prime moment when thieves strike. Though most people think that they will hit their homes, cars are also a prime target. A hidden car gun safe ensures that thieves won’t find your guns when they open up your car to steal your belongings. Plus, even if they do find the safe, they will have a hard time breaking it open. Nowadays, criminal liability is an important concern. If someone takes your guns and uses them for a crime, you will want to show that you did your best to protect them. A car gun safe is good proof that you take gun safety and responsibility seriously. This ensures that you won’t be liable in any lawsuits involving your guns if they end up in the wrong hands. You need to use a car gun safe properly if you want to get its fulls benefits. Here are some basics on maintenance and usage so you know what you’re doing. Vehicle gun storage is all about two things: ensuring weapon safety while maintaining weapon security. They may seem like the same thing, but they’re not. Weapon safety is about ensuring that your guns won’t get any damage as you transport them. This is an overwhelming concern for gun owners. To keep your guns safe in transport, you should make sure that your car gun safe has proper padding. You should also look into additional protection for your guns. Weapon security is the other concern when you have a gun safe. This ensures that your guns are safe from any curious or thieving hands. The best way to do so is with a safe that has a mix of two locking choices. A dial lock and an electronic lock alone would be secure enough, but having both will be the best way to stop people from taking your guns without permission. A vehicle rifle safe needs to be in top condition if you want it to keep protecting your belongings. Rust, corrosion, and other factors can slowly degrade your gun safe. This is why you want to regularly clean and oil your gun safe. Cleaning should only require a soft cloth to wipe away the dust, a cleaning solution to help with more stubborn dirt, and another piece of dry cloth to dry everything. Oiling just requires you to apply oil to the hinges of your safe on a regular basis. After application, wipe away the excess oil so that your safe looks clean as always. What size of car gun safe should I buy? It depends on the size of your gun collection or guns. Since this safe is only for transport, a safe that can fit several of your guns should be enough. Do I really have to spend a lot of money on a safe? Quality has a high price. If you want maximum security, be ready to pay for it. This depends on how big it is and what guns you store in it. The right combination for a car gun safe is accessibility and comfort. For handgun-sized safes, a space below the driver’s seat is often a good choice. This lets you reach it easily, while adding another layer of protection. 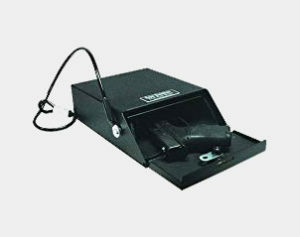 For rifle safes, the passenger’s seat can be a good hiding place. If you don’t want to get fancy though, the trunk of your car can work in a pinch. How often should I change the combination? You do not need to change it as often as you change your computer passwords. Maybe once a year is a good enough frequency. What if I lose the key or combination? Immediately contact the safe maker or a locksmith to help with your problem. After looking at your considerations, you will be able to find the best car gun safe to meet your ideal needs, wants, and preferences. Many of these are also portable gun safes making them convenient as well as efficient. Many gun owners also tend to travel whereas others are in the line of duty. It may be easy for culprits to pick car locks and this is more reason why every gun owner must invest in the best possible car gun safe that will also protect their valuable documents from theft. The best comparison chart needs to include extra models for a more informed decision. However, I have to admit the car gun safe helped me choose my ideal model since I needed something small in size to fit in my car booth. The Southern Homewares Portable Car Safe good enough for me. I also want to buy the same model for my gun ardent friend during his birthday.